cropped from Maxwell, facing page 117. The Racing 16, a hollow board with timber frame with plywood skin, was first built by Frank Adler at Maroubra, no doubt based on the widely circulated design by Tom Blake (USA). Given the emphasis established by the Life Saving Clubs on rescue and racing, the light weight advantages of the design were quickly realised. Although some builders may have recreated their Alaia boards, most were to follow Tom Blakes' lightweight copy of a traditional Olo, with lenghts eventually reaching sixten feet and the boards narrowing to less than 20 inches. As was the case with the Hollow board's paddling successes in Hawaii and the USA, the design dominated at carnivals. This was demonstrated by Frank Adler's competition wins despite his considerable weight (Maxwell?). The design however downplayed wave riding technique and taking the largest wave on a straight line to the beach was considered the fastest, race wise. An addition noted on Australian boards is the (stainless) steel handle fixed at the tail, used by the rider to hold and/or push the board through breaking waves. Some examples also use an very fine timber gunnel on the rail, to assist in balance when both paddling and riding. In 1934 Tom Blake added a small water ski type fin/skeg to one of his hollow boards. 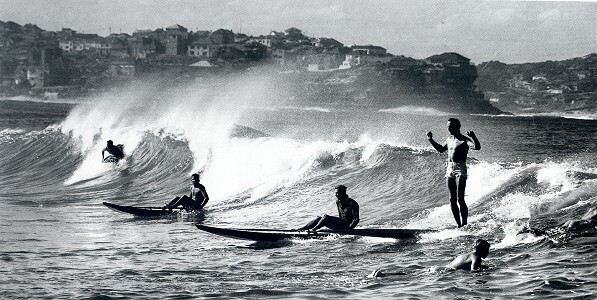 Although an significant addition, because of the emphasis on paddling, the small size relative to the board, the increased danger and the difficulty in attachment, many riders did not consider fins necessary and it rarely appears on Australian examples of long Hollows. Many examples of this long serving (1934 to 1956) design are in existence, mostlong established ASLA clubs have one mounted in the clubhouse. The adoption of the Hollow board was not the only surf-craft development of this period. 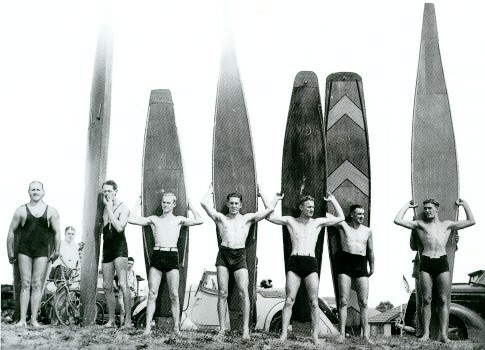 The Surf ski, Surf-o-plane and the Belly board were significant alternatives to wave riding of the period. The belly board initially adapted the paipo design, built of laminated solid wood with steamed or shaped scooped nose, in the manner described in Popular Science/Mechanics of the time. Later models used laminated plywood, and later still fins and sometimes a nose grip. Structurally, if a board is hollow it should have a drain or pressure plug to let out any water from dings and to equalise the pressure for climatic extremes. 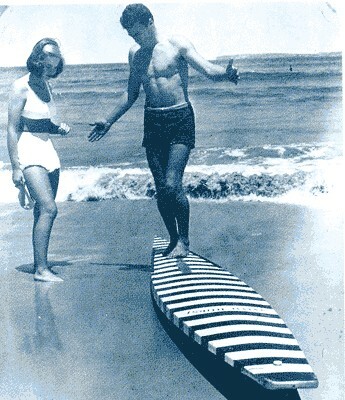 In 1935-1936 Bern Gandy acquired an imported Redwood-balsa laminate surfboard, probably from California. and surfed it at Lorne, Victoria. Impressed with the lightness of the board compared to the solid redwoods, he built his own 10ft 6'' model. The blank was two 10'' x 4 '' balsa blocks with a redwood stringer. This new board was surfed at Torquay in 1937, and Bern took the board with him when he relocated to Sydney in 1938. - Press clipping, un-sourced, on display at Scott Dillon's Legends Surfing Museum, Coffs Harbour, June 2005. A surf canoe was designed and built by Jack Myers in 1933 at Freshwater. It was 9 foot x 2 foot 6 inches with a semi-rounded bottom. Construction was a hardwood keel, local tea-tree ends with buoyancy tanks and covered with marine ply. 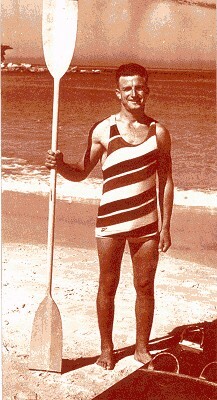 Jack and his canoe, named 'Lady Ruth', placed second in South Curl Curl's carnival on 1st January 1934. Myers page 85. In 1934 Jack Myers designed and built another canoe with George Henderson , this one a lighter model with canvas stretched over a ribbed frame and named 'Hot Shot'. 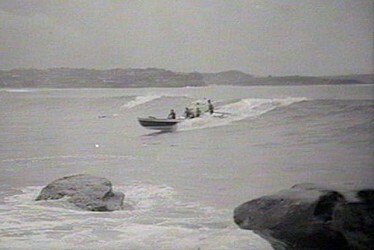 George Henderson and 'Hot Shot' won the canoe race at Curl Curl's carnival, 1st January 1935. 1934 Surf Ski, hollow board construction applied to Dr G.A. Crakanthorpe’s original design and used up to the mid 1960’s. Early models were 8 ft x 28" x 6" thick with a '12" spring in the tail'* (tail lift), but an emphasis on paddling soon saw lengths extended and widths narrowed. 1935 'G.K.' 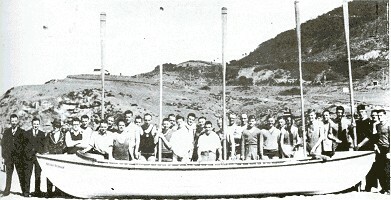 Manly surf life saving Club’s 7th surfboat, carvel built by E. & A. Townes, of Newcastle. This lighter design was adopted by many other clubs. Helensburgh-Stanwell Park Boardriders, 3 March 1935. Thorn: Stanwell Park SLSC (1983) page 22. The Bennetts - when delving into the history of this club, it is important to record the valuable assistance rendered by the late Bill Bennett who was a Cartage Contractor at Helensburgh. Bill provided his truck free of charge to the club for the conveyance of members and their gear to and from the various carnivals. This service was continued by his son, Harry. During the depression the generosity of the Bennett's enabled many members to attend carnivals, which their financial position would not otherwise permit. Harry will be remembered for the rescue he took part in at the south end of the beach, whilst clad in his birthday suit." -Thorn: Stanwell Park SLSC (1983) page 64. "Albert Brown - known as "Pal", a very active person in all club affairs, was boat sweep for many years. Assisted in maintaining discipline amoung younger members and their training in surf boats." -Thorn: Stanwell Park SLSC (1983) page 63. 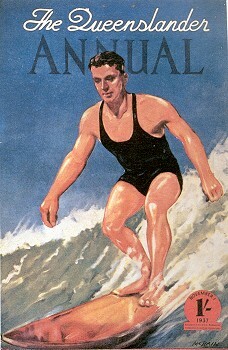 "Tom Bennett -"Red", cousin of Harry Bennett, an outstanding surfer of the 1930's, teamed with notable swimmers Owen and Charlie Griffith, Lance Cutcliffe, Harry McDonald, Toby Barton, Oscar Cook and Ian Melville to provide possibly the strongest swimming competitors the club has experienced and a force to be reckoned with by any other club. Tom's son, Charles of the Bulli Club proved a top belt swimmer winning many Branch Championships. "Red" enlisted in World War 11, was captured in Greece and made a P.O.W. in Germany for a number of years." -Thorn: Stanwell Park SLSC (1983) page 65. Jack joined the club on the 28th February, 1912, at the age of thirteen years and enlisted in World War 1 at the age of eighteen years. On discharge from the army he eventually took employment at the Naval Dockyard, Garden Island. Jack became foreman boat builder and was able to use this knowledge in the various craft he constructed voluntarily for this club. He was also able to repair many of our craft when necessary. The year 1921 saw the appointment of Jack Mawson as Club Captain, a position he fulfilled with distinction for the next twenty-four years continuously. As Captain, Jack took a personal interest in all members, giving them encouragement and tuition where ever possible in their surfing activities and most importantly sound advice on the necessity to improve their position in life. As leader, he extended tolerance and sympathy, but was also able to exert discipline and drive. "Daki" became a household name, not only in our club but to the surfing world in his era. Jack was a strong surf swimmer and board rider, instructor of March Past and R. & R. teams. He was an Illawarra Branch Delegate to the S.L.S.A. for a period of twenty years and was made a Life Member of the Illawarra Brandch and this club." -Thorn: Stanwell Park SLSC (1983) page 61.
."Ian "Snow" Melville - outstanding junior surfer particularly strong in belt races not only in club events but in the Illawarra carnivals. Still maintains a keen interest in club matters and a worthy contributor to the financial needs." "A damaged boat was received from the Maroubra Club, formerly used by them and known as the "Arthur Rodman", named after Arthur Rodman a most respected President of that club for many years. It was given to Stanwell Park Club on the condition that the name be retained. During the winter months of 1934 and 1935, much hard work was carried out repairing the boat by members of the club under the skill and guidance of Jack Mawson. It was of heavy construction and required quite a number of helpers to carry it up the beach after use. This craft was launched on the 1st September, 1935 by J. S. G. (Gordon) Worland, President of the Illawarra Branch. It might also be mentioned that Gordon Worland served in the capacity as Branch President from 1933 to 1945. Gordon had shown a keen interest in the reconstruction of the boat, visiting our club on a number of occasions and it was a fitting tribute that he should officially launch the craft. The boat was eventually sold for £1 to club member, Jim McMahon, for fishing." -Thorn: Stanwell Park SLSC (1983) page 54. 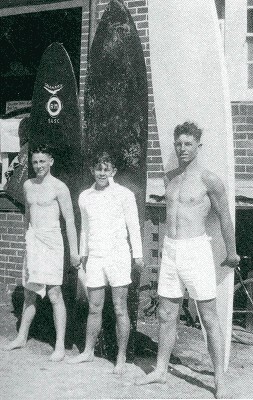 In late 1935, Collaroy SLSC member Bert Chequer, a noted surfboard shaper, used his board in a mass rescue. Assisted by 13 year old Bill Abbott, who twice swam out with belts, and a goup of inexperienced juniors on the reel, they managed to successfully return a group of approximately 10 persons to safety. Brawley (1995), pages 96 - 97. The solid wood boards were possibly shaped by Bert Chequer. Bob (Robert) Maladay's board features the Collaroy club emblem and his formal initials - RM. In November 1937, the Courier Mail of Brisbane printed a boardriding image by "McBain" as the cover of The Queenslander Annual.
'' was soon in mass production, being hired by the half hour on Sydney beaches, and proving popular with all ages and both genders. Surf-o-planes were... filmed for Movietone News 6/7 (1935), ...Movietone News 7/15 (1936), ...Movietone News 8/13 (1937), ...Movietone News 9/14 (1938) , which included shots of Dr Smithers riding his invention at Bronte, ...and...Movietone News 10/6 (1939) "
The craft was extremely popular, Manly Surf Life Saving Club reported 261 rescues for the 1938-9 season, half of which were carried out on or swept off rubber floats. Bloomfield, pages 54 to 57. Manly carnival in the 1930s. Cardigan: Icon (2008) pages 130-131. 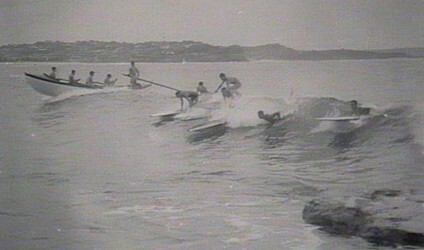 In 1936 Jack Toyer of Cronulla extended the surf ski to improve paddling. Concurrently 'Mickey' Morris and 'Billy' Langford developed the double ski, although their first model proved too narrow. During 1937, the Surf ski was adopted as standard life saving equipment after extensive testing at Maroubra (Maxwell page 245) and included in the Australian Chamionships as a rescue event with a paddler and patient. Galton page 79. 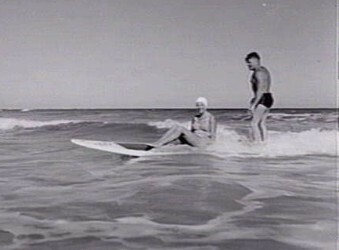 The Surf-ski was first seen on film in Movietone News 8/51 in 1937 at Manly, the riders riding sitting and standing with the paddles attached to the nose by rope. In 1937 at Hurstville, NSW, a company ("the only surf ski manufacturers") marketed a surf ski at seven pounds and fifteen shillings, packing and delivery by rail or boat for two shillings and sixpence, or fifteen shillings deposit and payments of three shillings and sixpence per week. In circa 1938 'Snowy' McAlister moved onto hollow longboards, and several seasons later converted it to as surf ski. On Sunday, 6th February 1938 the most celebrated rescue in the history of Australian surf life saving took place at Bondi beach. "Having had his name registered and his handicap awarded, Francis calculated he had 20 minutes to spare before the race and so headed for the water with a rubber surf mat known as a 'surfoplane'. 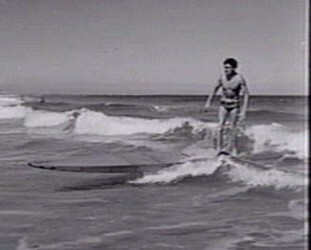 The surfoplane had been introduced to Bondi Beach a few seasons earlier by Stan McDonald. Along with his chairs and mutton oil tan: spray, McDonald leased the mats in their hundreds;riding them became a popular surfing activity at a time when board riding was still a marginal and almost exclusively surf club activity. 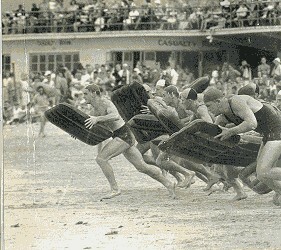 The surf mats soon became more popularly known as 'surfo- planes', the name of a rival surf mat manufacturer." This is in conflict with the substantial claim by Thoms (2000, page 40), and others, that the craft was invented by Dr Ernest Smithers circa 1934 which, at the worst, parallels Brawley's estimated time frame. Certainly it post dates a patent application (#9929 Class 3) for a "Surf plane" by E. E Smithers and C. D. Richardson which was lodged on the 7th October 1932. 7 October 1938, page 7. "Flat out on a skim-board. It's the latest, but no good for crowded beaches. It weighs 90 lb., is nine feet long, folds into four sections, is driven by a four horse-power outboard, and does 20 miles an hour." art of surf board riding at Bondi yesterday. champion surf board rider at bondi beach Club. probably issued for interstate competition. 29 November 1938, page 5. In the 1938-1939 season, Bill Hawkins of Manly paddled from Manly to Maroubra in three hours and was reported as missing when strong headwinds caused him to shelter in Manly cove on the return journey. "In 1938, Osmar Gonasalves, from the city of Santos Sans Paulo aged 16, surfed the first wave of Brazilian surfing history. built the first Brazilian surfboard. The board was built from Popular Mechanic Magazine. With technical support from the naval engineer Julius Putz, Osmar and Jua were behind the required material. They bought the wood indicated (cedar planks of four meters) and ran the project. Following the tips friend Putz and guidelines of the magazine, produced a board of 3.60 meters and weighed 80 kg." - Fluir Magazine presents - The History of Surfing in Brazil - 50 Years of Adventure, page?. In 1939 a highly sophisticated example of solid wood design was shaped by L.A.Morath. of Manly LSC Features include rail and tail grips, concave deck, metal tail and nose plates. A branded Outrigger Canoe Surf Club logo was possibly added to the board after Morath represented Australia at the Pacific Games, Honolulu ? Held by Morath family of Balmoral, restored to original condition by ICS/Chatswood. Nov, 1998. Currently displayed at Balmoral Beach Life Saving Club, Sydney. The Australian surf team to the Pacific Games, Honolulu were selected at local competitions. 1. Several races were held as selection trials for the 1939 -1940 Pan Pacific Games in Honolulu. 2. 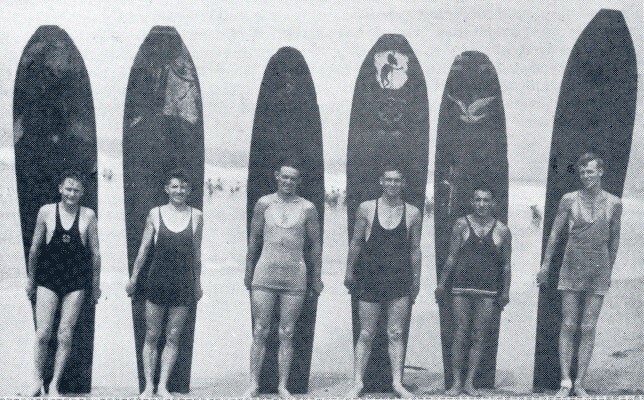 The photograph has been substantially cropped, the rider on the far left is missing the top half of his board. 3. Variations in board length and design. 4. Lou Morath, second from the right. Other riders should be identifiable. The Australian surf team were selected at local competitions. Russell, who made hollowboards and popularised the kneeling position for paddling, won the Hawaiian championship. "Les McKay, the Club Champion, in his first season in the club, was selected as a member of the Australian Surf Team, to visit Honolulu, Hawaii, for the Pacific Surf Games in 1939. Les was well over six feet tall, very solidly built, and excelled as a swimmer and beltman. After many selection trials during the season, he received both the honour of representing Australia on the first overseas surf tour and of being the first North Cronulla member. selected in an Australian team. Those who made the journey to Hawaii were the envy of all surfers in Australia; for of those applicants chosen, scores failed." Larsen and Belbin: North Cronulla (1976) page 22. "Before his departure for Honolulu, Les was farewelled at a dinner at the Hotel Cronulla. Later in the evening a farewell dance was held in the club house, where Club Captain, L. W. "Ding" Campbell, made a presentation to Les on behalf of the club members. Miss Aileen Atkinson (now Mrs. Griffiths), on behalf of the Ladies Committee, presented a silver cigarette case to Les and a bouquet of flowers, in the club colours of blue and gold, to Mrs. Muriel McKay. Les was to travel to further honours in 1948 at the Olympic Games in London, representing Australia once again in the water polo team; he also achieved the distinction of being Standard Bearer for Australia at the opening ceremony at Wembley Stadium." -Larsen and Belbin: North Cronulla (1976) page 23. Hermie Doerner capped off such representative honours for the club in 1939 when he was selected for the SLSA team that visited Honolulu. Doerner captained the team, which was accompanied by Bondi club stalwart, Tom Meagher. 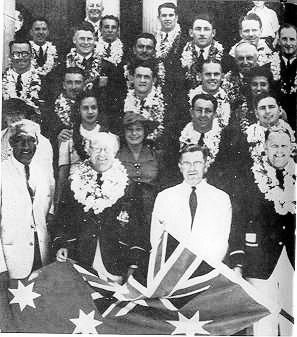 Duke Kahanamoku (left) welcomes the Australian team to the Pacific Games Honolulu, 1939. Olympic swimmer and industrialist Sir Frank Beaurepaire's rubber company manufactured a Surf-o-plane using the Advanx brand. There were eventually three models - Elite (5ft), Standard (4ft) and Small (3ft). Colours other than black were also available - yellow and black with yellow stripes. Sold to the public from the factory at Neild Avenue, Rushcutters Bay Sydney for 8 pounds ($16.00), the company also offered a repair service and compressed air fill ups. -ABC Radio Talkback, circa 1998. By the 1960 the design was available from several companies, notably Clarke Rubber and Advanx, and with the expanded use of the automobile sales were directed more at the general public than the hire concessions. This was principally done by elaborate decor, for example the Advanx Marlin model as surfed by Nick Carroll in 1969, while some later models had twin fins. Because of the disruption to the surf clubs and their memberships during World War II, Australian Championships were not held in the seasons between 1940 and 1945 (48). As a substitute, the SLSAA oranised zone competitions, which were held during the 1942-19843 and 1943-1944 seasons in the Sydney metropolitan area. These competitions culminated in a metropolitan championship carnival, and were followed by a SLSAA 'patriotic' championship carnival, the proceeds of which went to charities such as the Australian Red Cross Prisioners-of-War Fund, and the Australian Comforts Fund (49). Hollow board owners who were committed wave riders determined a small area of the board where they stood and enhanced grip by applying a paint and sand mix. Some riders alternatively applied a small section of timber ridges across the board - in a similar manner to modern adhesive rubber deck patches. Boards were heavily varnished or painted to cover and protect the copper nails. Reported and illustrated by Scott Dillon at his Legends Surfing Museum, Coffs Harbour, June 2005. The "Jack Mawson" was named after the illustrious Captain. 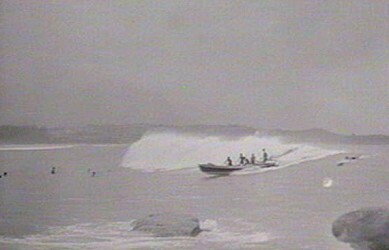 When it was suggested that a plywood surf boat be built there were many who had doubts about the likely durability of such a craft in the sea conditions experienced at Stanwell Park. However, these doubts did not deter the wiIy Jack Mawson and he soon got permission to build such a boat. Thus Jack 'Daki' Mawson with some assistahce from other volunteers was to spend many hundreds of hours in Fletchers boat shed on the Georges River building the boat, which when completed presented a wonderful appearance. Boat rules and the boat name were decided six months before the craft was completed and so all was in readiness for that launching day- 17th June, 1945. The launching ceremony was performed by Mrs. Moseley and the launching crew was Bill Jardine, Geoff Russell, Jack Standen, Harry Bennett and Ken Redshaw. Crews trained very diligently, as there were always others wanting to get into the boat crew. The club was successful in winning the Illawarra Branch Championships in 1946-7 and in 1948-9. The first winning crew consisted of Bruce Russell, Jack Brandwood, Bob Malcolm, Jim McMahon and Con Asmussen, and the 1948-9 crew was the same except that Norm Trevithick had replaced Con Asmussen. The Jack Mawson was in service right up to 1954 either as a first or second boat \and in that year it was given to Fairymeadow Club providing it was used for lifesaving purposes and that it was housed under cover. -Thorn: Stanwell Park SLSC (1983) page 55. It seems that the SLSAA did not want this new ''hedonistic'' Association, which also had women members, involved in its competition or competing for the social space which was occupied by disciplined surf life saving clubs on Australian beaches. The Board Association was refused affiliation by the SLSAA on the grounds it was not a life saving club, and members of life saving clubs were prohibited from participating in surf events organised by an unaffiliated association. The advent of the board Association seemed to precipitate the SLSAA's formation of a Surf Board and Ski Section, and formulation of appropriate rules for use of boards and skis in its affiliated clubs, as a means of recues and in carnivals (105). Noted North Bondi SLSC surfboard champion and surfboat sweep, Keith "Spaz" Hurst demonstrates his technique on his "Magpie" board, Bondi circa 1947. Elder: North Bondi SLSC (2006) page 103. 18 January 1947 page 18. 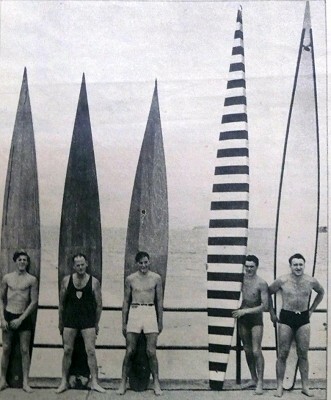 In 1948 Bill Wallace was sweep of the Bronte SLSC boat. - Photograph, unsourced, on display at Scott Dillon's Legends Surfing Museum, Coffs Harbour, June 2005. December 1948 : Outdoors and Fishing Magazine, Hudson Publications, Sydney. A full page advertisment for Mick Simmons' Sports Stores includes "The Winner" a surfmat described as a 'canvas and rubber inflated surfboard', priced at 67/- (67 shillings?). In the classfied section , Seacraft Plans Pty Ltd, Sydney listed a large number of boat plans for sale by mail, including plans for surfboard, 14 ft and 10ft, and surf-ski. Price 8 shillings. The issue also contained advertising for metal and rubber suction cup roof racks to transport a boat or skis. Two surf board girls at Torquay, 1949. Hollow Board Surfer, Torquay, 1949. In 1948 discussions were taking place with the Council with a view to them assuming ownership of the surf clubhouse. Some members felt that club funds may also be sought by the Council so it was decided to utilise the available funds to invest in a new surf boat. The order was placed within N. & E. Bowns of Newcastle at a cost of £217. Initially the boat was to be "double rigged" as crews felt that it was better for the bow rower to pull rounding the buoys rather than be "back watering" to effect a quick turn around. However, the boat builder dissuaded the club from pursuing this idea. On 9th October, 1949 the craft was launched by His Honour Judge Adrian Curlewis (later to become Sir Adrian)"
Thorn: Stanwell Park SLSC (1983) page 55. "Keith Suann was the (Cronulla) Club's inaugural surfboard champion in the 1951-2 season (102)". "Though a new craft was launched in 1954, the Jack Mawson 2 remained in service unt 1962 when it was donated to the Yowie Bay Sea Scouts." Thorn: Stanwell Park SLSC (1983) page 56. "The (Cronulla) Club's fortitude was tested in 1954 when Jantzen Girl, an already successful surf boat, was destroyed by a freak wave at the North Steyne carnival in January. Launched in 1952-1953 season, it was built by the Club's Vice-President Roy Phillips employing the latest technology, and to the specifications of leading Cronulla boatmen. ... a new surf boat apty named Good Samaritan was launched in March 1954,"
As boat builders were holding many orders for boats which they could not supply speedily, consideration was given as early as 1951 to placing an order for a boat, but it was decided to defer for a while. A further move in November, 1953 met with the same result. However, a Special General Meeting in February, 1954 decided to order a tuck stern boat from Phillips, Boat Builders. Mr. Sam Frew, the editor of the "District News" circulating in the district, offered to conduct a newspaper appeal to raise funds to purchase the boat and this offer was readily accepted. The craft was completed and delivered in time to be launched on Boxing Day, 1954. The official function was performed by Jack Mawson and to his credit Mr. Frew honoured his stated intention by going for a trip through the surf in the boat straight after the official launcing." -Thorn: Stanwell Park SLSC (1983) page 56. Elder: North Bondi SLSC (2006) page 125. 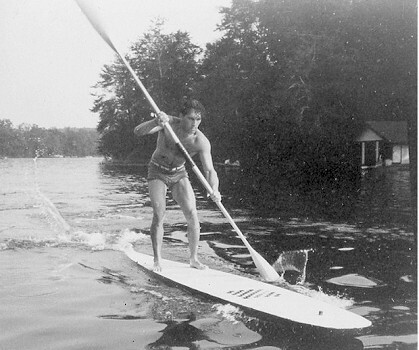 Stand Up Paddle Rider, circa 1940. The source and location are unknown. the double bladed paddle possibly from a surf-ski. Note the chess-board decor on the deck. Geoff Cater (2000-2016) : History : The Australian Racing 16, 1940.